SCVHistory.com | U.S. Army Air Force Plane, Glider Crash Near Castaic; Girl, 9, Helps Rescue 3 | 1-31-1943. Local Girl, 9, Helps Rescue 3. 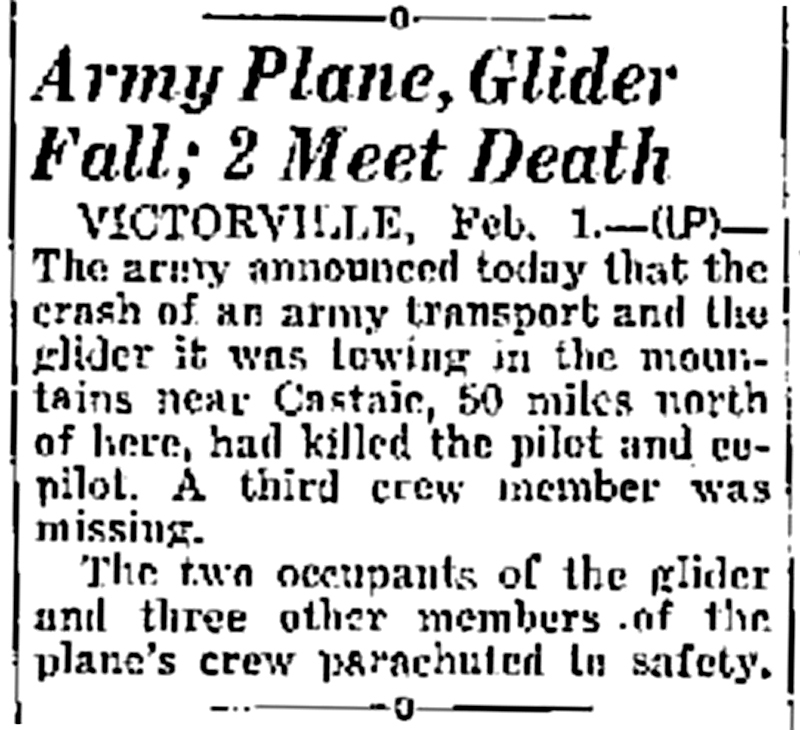 An Army Air Force C-53 Skytrooper transport ship (a modified DC-3) out of Victorville was towing a Waco CG-4A glider on Sunday, Jan. 31, 1943, when the two aircraft hit sudden turbulence between Piru and Castaic. According to historian Gary Patric Macha, author of "Aircraft Wrecks," the shaking of the glider at the other end of the tow cable ripped the tail section off of the Douglas aircraft. Three aviators in the fuselage of the C-53 were hurled out into space and managed to parachute to safety, landing about five miles west of Romero Canyon in the Castaic area and sustaining major injuries in the process. Three other crew members in the forward section of the C-53 went down with the plane, which crashed nearby on mountainous ranch property now (2014) owned by Francine Rippy. The crew members inside the glider popped the cable loose, and lacking a flat place to land, they bailed out and allowed the craft to crash. They sustained only minor injuries. Army Plane, Glider Fall; 2 Meet Death. By United Press | As published in The Times (San Mateo, Calif.) | Monday, February 1, 1943. Victorville, Feb. 1. — The Army announced today that the crash of an army transport and the glider it was towing in the mountains near Castaic, 50 miles north of here, had killed the pilot and co-pilot. A third crew member was missing. The two occupants of the glider and three other members of the plane's crew parachuted to safety. News story courtesy of Lauren Parker. One Girl Red Cross Corps. Heroes? Marylynn's Only Nine, But Fliers She Mothered Say She's Tops. The Associated Press | As published in The Oakland Tribune | Tuesday, February 2, 1943. 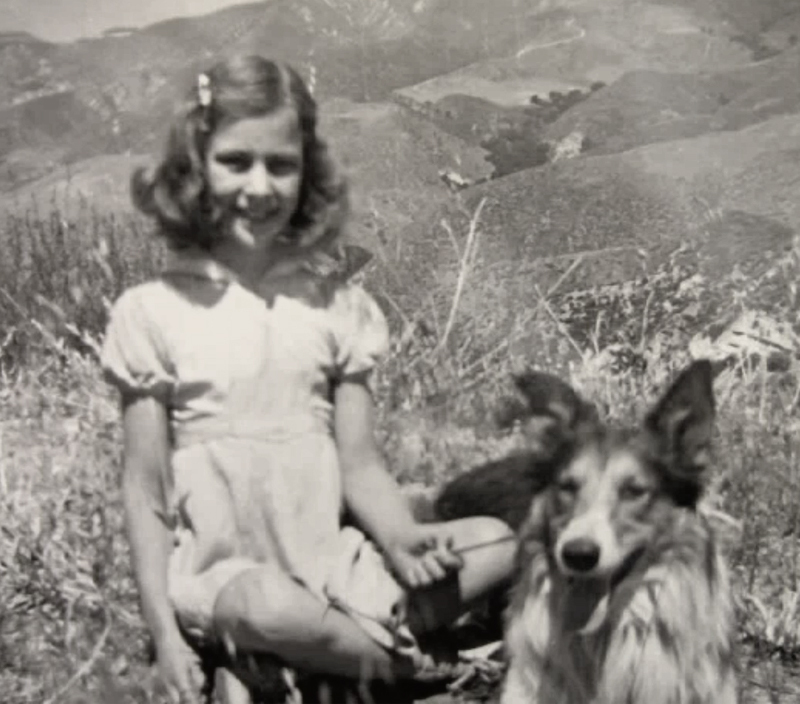 Castaic, N.C. [sic], Feb. 2 — (AP) — Two fliers injured in an Army plane-glider crash near here may meet many heroes before the war is over, but they'll remember 9-year-old Marylynn Winkler. Marylynn, daughter of N.C. Winkler, a rancher, hiked five miles to reach the injured men, Staff Sgt. Robert Edelman of Long Island City, N.Y., and Pvt. 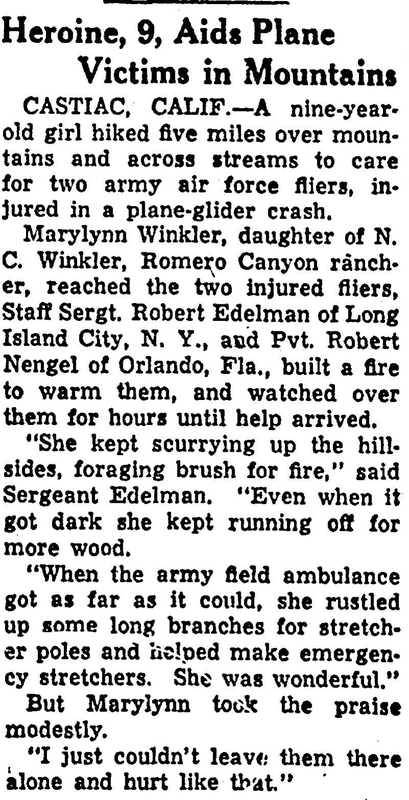 Robert Nengel of Orlando, Fla.
She made innumerable trips up the rugged slopes, rustling firewood to keep them warm. She did what she could to make them comfortable. When she couldn't find anything else to do, she watched over them quietly, while rescuers made their way to the remote crash scene. "She was wonderful," said Sergeant Edelman. "Even when it got dark she kept running for more wood. And then, when Army ambulances got as close as they could, she hunted up long branches for stretcher poles." Marylynn saw nothing untoward in her performance. "I just couldn't leave them there alone and hurt like that," she said modestly. Killed in the crash were Flight Officers Wilbur Boyd of Anacostia, Washington, D.C., and Neil W. Rise, Beverton, Mich. Edelman and Nengel parachuted to safety, as did Pvt. David P. O'Connor, San Jose. Still missing is Staff Sgt. C.E. Burnett, Graysville, Tenn. The crash occurred Sunday during a routine training flight. News story courtesy of J.R. Sanders. Three Thrown Clear as Plane Hits Peak Saved. Two in Crew of Transport Towing Glider Killed, One Missing, Five Escape. San Bernardino County Sun | Tuesday, February 2, 1943. 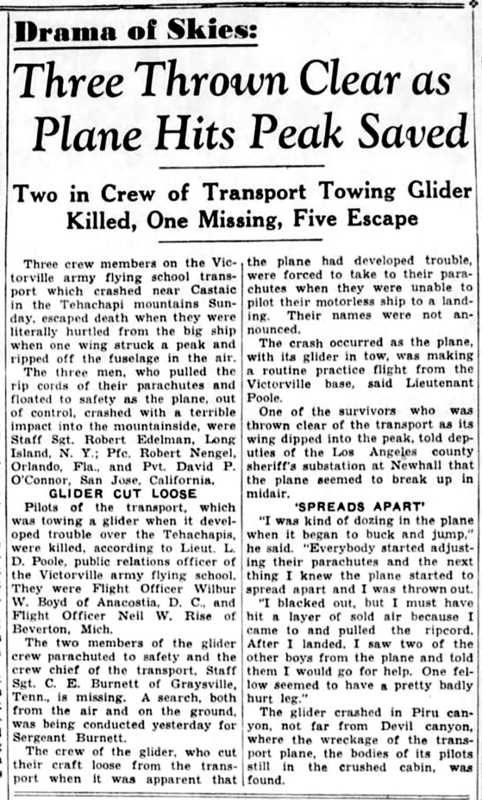 Three crew members on the Victorville army flying school transport which crashed near Castaic in the Tehachapi [sic] mountains Sunday, escaped death when they were literally hurtled from the big ship when one wing struck a peak and ripped off the fuselage in the air. The three men, who pulled the rip cords of their parachutes and floated to safety as the plane, out of control, crashed with a terrible impact into the mountainside, were Staff Sgt. Robert Edelman, Long Island, N.Y.; Pfc. Robert Nengel, Orlando, Fla., and Pvt. David P. O'Connor, San Jose, California. Pilots of the transport, which was towing a glider when it developed trouble over the Tehachapis, were killed, according to Lieut. L.D. Poole, public relations officer of the Victorville army flying school. They were Flight Officer Wilbur W. Boyd of Anacostia, D.C., and Flight Officer Neil W. Rise of Beverton, Mich. The two members of the glider crew parachuted to safety and the crew chief of the transport, Staff Sgt. C.E. Burnett of Graysville, Tenn., is missing. A search, both from the air and on the ground, was being conducted yesterday for Sergeant Burnett. The crew of the glider, who cut their craft loose from the transport when it was apparent that the plane had developed trouble, were forced to take to their parachutes when they were unable to pilot their motorless ship to a landing. Their names were not announced. The crash occurred as the plane, with its glider in tow, was making a routine practice flight from the Victorville base, said Lieutenant Poole. One of the survivors who was thrown clear of the transport as its wing dipped into the peak, told deputies of the Los Angeles county sheriff's substation at Newhall that the plane seemed to break up in midair. "I was king of dozing in the plane when it began to buck and jump," he said. "Everybody started adjusting their parachutes and the next thing I knew the plane started to spread apart and I was thrown out. "I blacked out, but I must have hit a layer of sold [sic] air because I came to and pulled the ripcord. After I landed, I saw two of the other boys from the plane and told them I would go for help. One fellow seemed to have a pretty badly hurt leg." The glider crashed in Piru canyon, not far from Devil canyon, where the wreckage of the transport plane, the bodies of its pilots still in the crushed cabin, was found. Time Magazine | February 15, 1943. From a ranch in California's Romero Canyon last week, dark-haired, nine-year-old Marylynn Winkler watched the flight of a glider-towing plane. Suddenly the plane seemed to "break up in mid-air." Marylynn hurried over five miles of mountain and streams, found an injured Army sergeant and private. (Two others were dead.) In the mountain wilderness, Marylynn built a fire to keep the soldiers warm, stood by for five hours until the ambulance arrived. Then she found sapling poles for stretchers. Said Marylynn: "I just couldn't leave them alone and hurt like that." Said the sergeant: "She was wonderful." News story courtesy of Jason Brice. Heroism of a Little Girl Who Aided Injured Aviators. Salt Lake City Tribune | Saturday, June 6, 1943. Heroism may be defined as a triumph of soul over self, of duty over danger. According to Thomas Carlisle, "society is founded on hero worship." It is a healthy devotion, as it stimulates the young and stirs the old to renewed faith in mankind. "To admire heroism makes heroic people," said Disraeli. But the peril of warfare is not the only incentive to daring deeds, nor is the blaze of a battlefield the only crucible in which heroic natures are developed. As Gray pointed out in his immortal "Elegy," every scene may have its "Village Hamden," its local "Cromwell, guiltless of his country's blood." In out-of-the-way localities, in rural homes, in simple lives, the spirit of service and sacrifice — sometimes ignored by fate, is passed up by opportunity which does not knock at every door. Take the exemplary behavior of little Marylynn Winkler of southern California. She heard an army plane crash on a hilltop five miles from her home and set out for the wreckage to see if she could be of help. She found two badly injured survivors and four dead soldiers. Although but 9 years old, she went to work and built a fire and did what was possible to make the men more comfortable. For hours, until rescuers arrived, she carried brush and wood up the rugged slope with the solicitude of a saint and the endurance of a marine. But she waved all compliments aside, saying: "It was something anyone would do. I just couldn't leave them there alone and hurt like that." 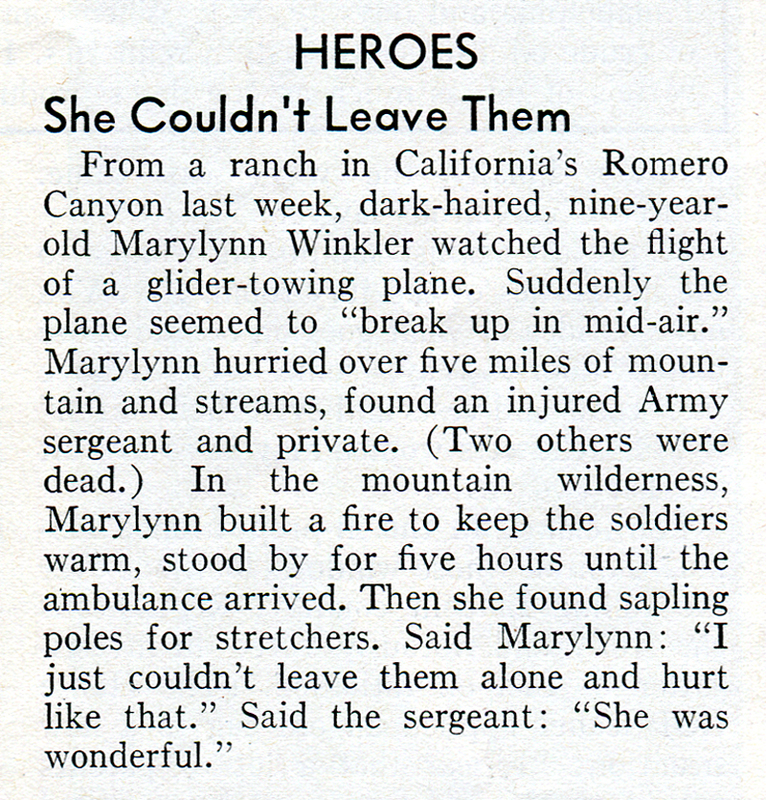 Long live that little 9-year-old lass — Marylynn Winkler of Castaic, Cal.! May her heroism and philanthropy be remembered and revered. Heroine, 9, Aids Plane Victims in Mountains. National Labor Tribune, Pittsburgh, Penn. | Saturday, April 17, 1943. Castaic, Calif. — A nine-year-old girl hiked five miles over mountains and across streams to care for two army air force fliers, injured in a plane-glider crash. Marylynn Winkler, daughter of N.C. Winkler, Romero Canyon rancher, reached the two injured filers, Staff Sergt. 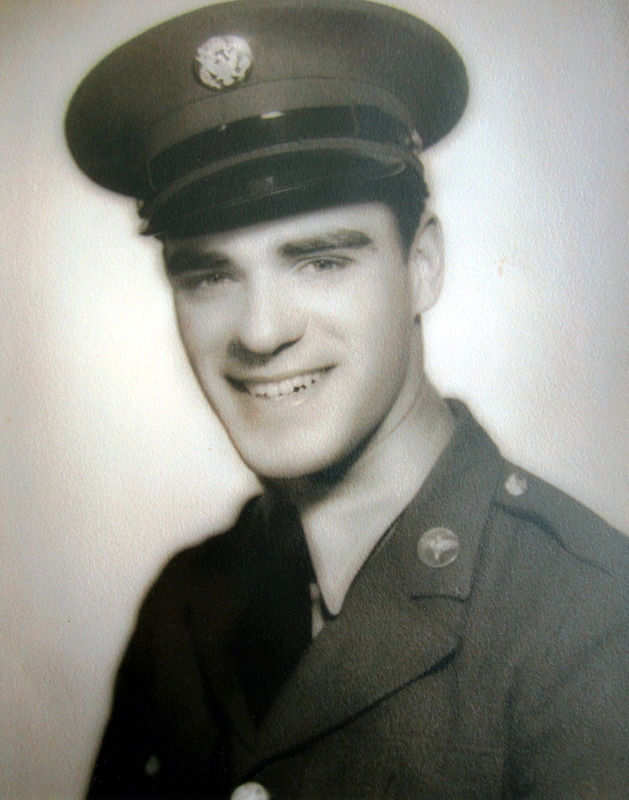 Robert Edelman of Long Island City, N.Y., and Pvt. Robert Nengel of Orlando, Fla., built a fire to warm them, and watched over them for hours until help arrived. "She kept scurrying up the hillsides, foraging brush for fire," said Sergeant Edelman. "Even when it got dark she kept running off for more wood. "When the army field ambulance got as far as it could, she rustled up some long branches for stretcher poles and helped make emergency stretchers. She was wonderful." But Marylynn took the praise modestly. "I just couldn't leave them there alone and hurt like that." News story courtesy of Tricia Lemon Putnam. Narrative: Crashed; crew bailed out. Listing courtesy of Jason Brice.